B Flight No. 75 (NZ) Squadron, Mepal, June 1945 – NZBCA archives, Ivan Carroll collection. 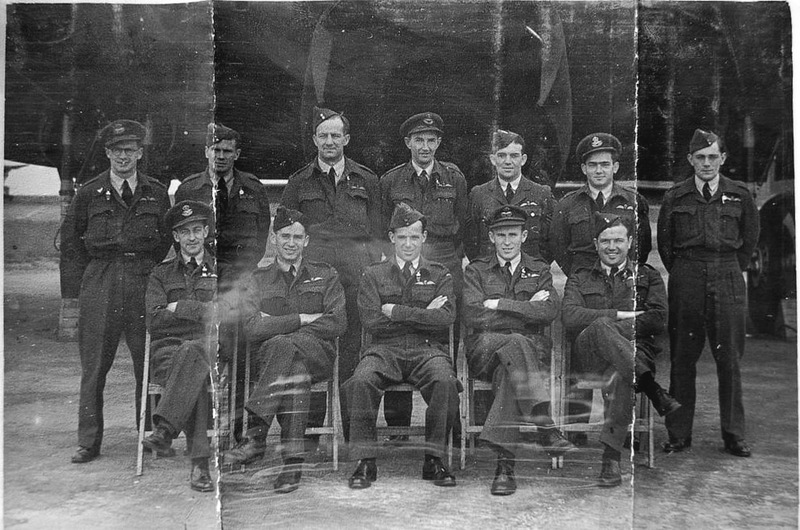 Thanks as always to Chris for doing a bit of detective work on this photograph of ‘B’ Flight Pilots, taken in June 1945 and generously passed on by Peter from the NZBCA archives. Flying Officer Ivan Carroll arrived at Mepal on 13 March 1945, flew his first op’ on 18 March, and stayed on with the Squadron after VE Day for Tiger Force training at Spilsby until 29 September. This is the first formal group photo I have seen from the immediate post-war period. Back row: F/O Bruce Crawford (F/O Roderick Bruce Crawford, RNZAF, NZ427551), F/O John Young (F/O John Simpson Young, RNZAF, NZ4213650), Self (F/O Ivan Silvester Carroll, RNZAF, NZ4213254), F/O Hardie (F/L William Leslie Hardie, RNZAF, NZ 428111), F/S Daly (F/O Alfred George Daly, RNZAF, NZ4211789), F/O Don Shearer (P/O Donald Babington Shearer, RNZAF, NZ4210512), F/O Pete Trevarthen (F/O Peter Lloyd Trevarthen, RNZAF, NZ429974). 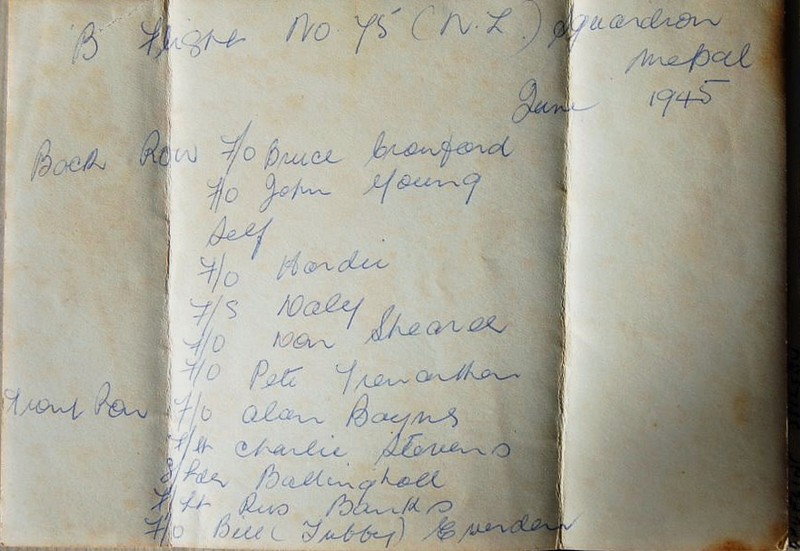 Front row: F/O Alan Baynes (F/O Allan Ralph Baynes, RNZAF. NZ427453), F/L Charlie Stevens (F/Lt Charles Mackenzie Stevens, RNZAF, NZ4210535), S/Ldr Ballingall (Sqn Ldr. Alexander Stewart Ballingall, RNZAF, NZ2286, B Flight Commander), F/Lt Rus Banks (F/Lt Russell Ashley Banks, RNZAF, NZ416437), F/O Bill (Tubby) Evenden (F/O William Evenden, RAF, 1337365, 196039). As always, thanks to Peter Wheeler and the NZ Bomber Command Assn., for permission to reproduce this photo. See this photograph within the ‘Group Photographs’ section of the blog here. This entry was posted in general and tagged 75(NZ) Squadron RAF, Alexander Stewart Ballingall, Alfred George Daly, Allan Ralph Baynes, Charles Mackenzie Stevens, Donald Babington Shearer, Ivan Silvester Carroll, John Young, June 1945 'B' Flight Pilots Group Photograph, Mepal, New Zealand Bomber Command Association Archive, Peter Lloyd Trevarthen, Roderick Bruce Crawford, Russell Ashley Banks, William Evenden, William Leslie Hardie on September 29, 2014 by 75nzsquadron.